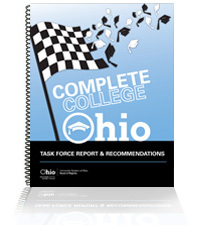 The Complete College Ohio Task Force Report & Recommendations identifies an array of policies, practices and programs for improving students’ college readiness, reducing the time it takes for students to attain a certificate or degree, and incentivizing progress and completion. Ohio currently ranks 38th among the states with only 26% of adults holding a bachelor’s degree, compared with a national average of 31%. That 5% gap represents billions of dollars in lost economic activity to Ohio—by some estimates, $2.5 billion a year for each percentage point. 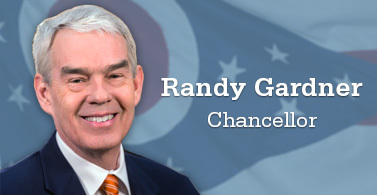 To address this issue, the staff at the Ohio Board of Regents has been asked to work with University System of Ohio adult career centers, community colleges, and the universities to implement curricular models for graduating students with the skills employers are seeking as quickly and cost-effectively as possible. This work will take place in tandem with our ongoing efforts to advance statewide credit transfer programs, initiatives to address issues related to remedial education, and increase the number of students graduating from high school with college credit. Ohio must take strategic and sustained action to increase the number of students who enter into our colleges and universities able to successfully participate and persist in their educational pursuits. The Completion Task Force will provide thought leadership for the development and implementation of a comprehensive agenda to increase the number and percentage of students earning meaningful credentials at Ohio’s public postsecondary institutions.